Hi all. I need some help with my drives. I've included an image of Disk Manager. I've quick formatted Drive E (Games) but there is an unallocated space next to it that I can't merge with Drive E. There is also a System Reserved 847mb that I want to get rid of and combine with Drive E. How can I do this? Thanks! The recovery partition is required and you need to keep it. You are really talking about less than 1GB of storage between the two sections you mentioned. Not worth it (to possibly bork your Games partition if you break anything). I suggest ignoring this altogether. I agree with @COLGeek. I also suggest you to ignore this as its only a matter of 847 MB & recovery partition is also must needed. I've quick formatted Drive E (Games) but there is an unallocated space next to it that I can't merge with Drive E. There is also a System Reserved 847mb that I want to get rid of and combine with Drive E. How can I do this? Ignoring is the easy way, of course. But, if you want to do it, you can. 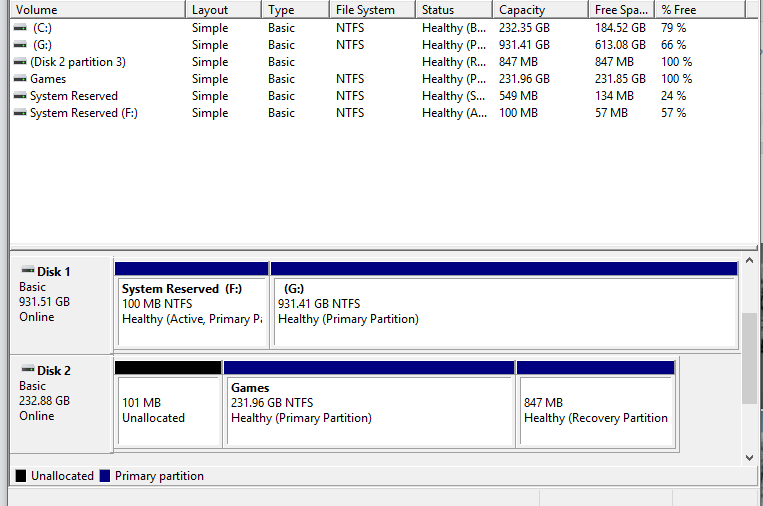 Delete all partitions from Disk 2 and create single large one. Deleting recovery partition will require use of diskpart. Disk Management normally doesn't allow this.